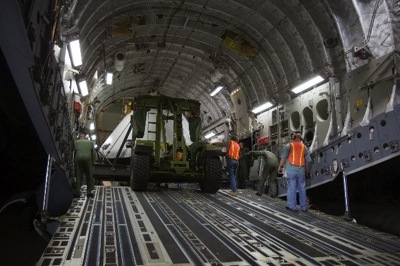 The Orion Flight Test Article (FTA) was transferred from the hangar at NASA Langley Research Center (home of NASA EDGE) to an Air Force C-17 cargo plane. The FTA is now on its way to NASA Dryden Flight Research Center to get a paint job and to add a whole bunch of electronic equipment. It’s great to see a piece of history as NASA embarks on a bold new journey back to the moon, Mars, and beyond! 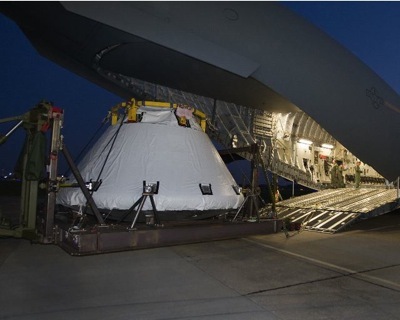 The Orion Flight Test Article will be used for the Pad Abort 1 test that will take place in New Mexico at the end of the year. Check out the cool pictures. Kudos to all the engineers, technicians, and managers who were a part of the project. A job well done! What a huge C-17 ! It’s just extraordinary to see Orion developing. I was just wondering if you know how I can obtain a space tomato seed for my biology project. We may be able to get you basil seeds instead of tomato seeds. Let me know if you are interested. Basil or tomato, seeds from space, now that is cool! That was a good question from Meg. I am also wondering how an average person like me, could get seeds from space. udos to all the engineers, technicians, and managers who were a part of the project. A job well done! Next Next post: The 15th Annual Great Moonbuggy Race Rocks!! !